The Redemptorists » Congratulations to the new Province of Thailand! Over the weekend, our confreres from the former Vice Province of Bangkok celebrated the establishment of their own Province. The first 4 missionaries from the then St. Louis Province came to Thailand in 1948. Year after year one or two new missionaries came to Thailand until the early 1970s. Now we have 2 Bishops, 47 priests, 7 Brothers and 9 professed students in theology; 2 in Novitiate; 21 in Philosophy; 10 Postulants and 60 in the Minor Seminary. There are 8 canonical communities. 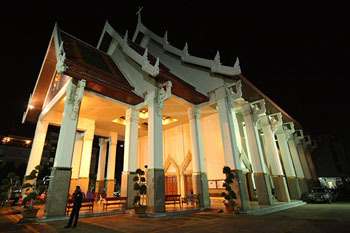 1st Phase: The First 25 years: (1948-1973): The focus for the first 25 years was the Udon Thani Diocese and parish ministry. Because of the demand of the mission, we could not live together as a community. We had a “home week” only once a month, except for confreres who lived in Bangkok and Sriracha. 2nd Phase: The Next 25 years: (1973-1998): Udon Thani Diocese continued to be our priority along with additional new initiatives, such as social work and school ministry. The emerging apostolate at this phase was social work ministry. Mission preaching had been on and off. We started our Major Seminary in this phase as well as a social work ministry in Pattaya which has become well known. We also started our foreign mission in Korea and joined in the mission to Nigeria. At this phase, we have strengthened the social work ministry by having more social service centers at Mercy Center, Bangkok and Sarnelli House, Nongkhai. The new mission in Chieng Mai diocese has begun along with the foreign missions. The model of community life is “home week community” since we don’t live together. New collaborative projects in Formation with other units has begun: Lipa and Davao. New initiatives like mission in Nakornsawan Diocese and in Laos have been started. More from Scala, international Redemptorist newsletter.